The Image Manager is used to manage pictures in the Repository, allowing them to be maintained and reused across diagrams. Images can be inserted in a variety of formats including Bitmaps and Extended Windows Metafiles are then used to change the conventional appearance of elements to create more appealing and compelling diagrams. The Image Manager's main use is to define pictures that can be used as alternate representation for elements in diagrams. For many business and networking diagrams the default appearance of an element such as a UML Class or Component can be replaced with an image from the Image Manager making the diagram more appealing to its audience. 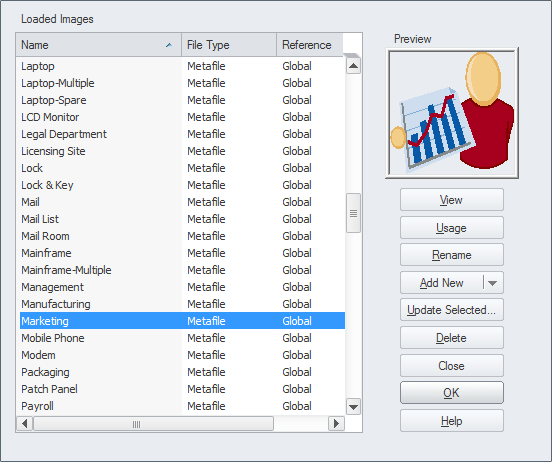 The Image Manager will also store images that are defined in included technologies. The Image Manager allows Images to be imported in a variety of formats including Bitmaps and Extended Windows Metafiles. Images can be imported from the file system or conveniently from the Clipboard. There is also an option to display the diagrams where the image has been used.